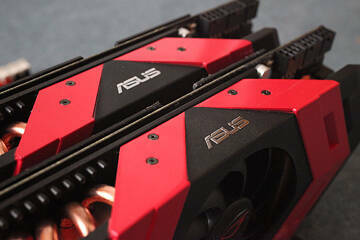 ASUS was very kind and sent us two of their ARES monster graphics card for testing in CrossFire. With a price of around $2000, such a setup can only be achieved by anyone with deep pockets and a deep love for technology. If you haven't done so yet, please check out the single card review first, as this review will only focus on the CrossFire combination of the ARES. Two of these beautiful babies basically cover the whole slot area of your motherboard, each taking three slots for a total of six. If you take another look, check out the massive number of power connectors required. A total of four 8-pin and two 6-pin power cables are sure to provide enough juice to the system for even your wildest overclocking dreams. In this review we will investigate the performance of two ARES cards, but we will also take a look at possible upgrade paths involving the ARES. 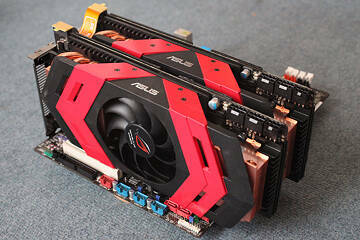 For example, if you have already have a HD 5970, how much can be gained from adding ARES to that? What if you come from a HD 5870?